Or any kind of website basics, for that matter - whether you are a small business, solopreneur, or executive director. Or you may think the opposite is true – that you’ve got to “keep up with the Joneses” on your site with cutting edge graphics, while ignoring fundamental must-haves. 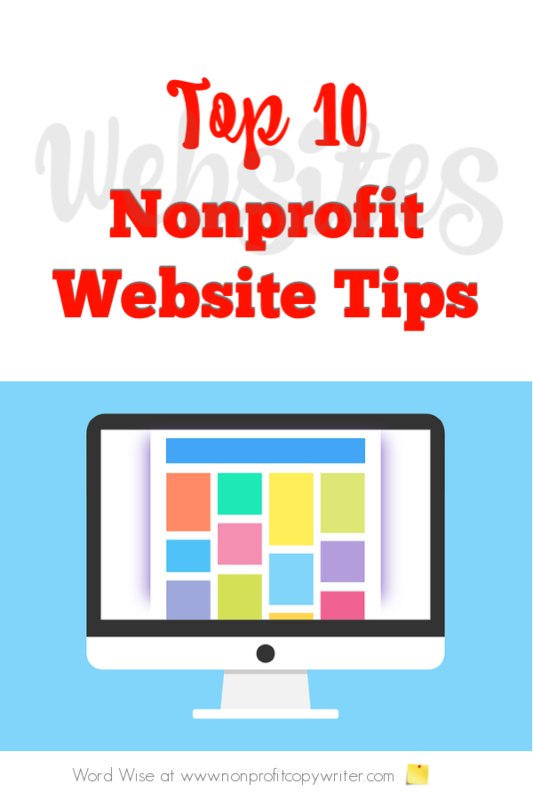 You’re right if you think the fundamentals for a nonprofit website – or any website, for that matter – aren’t important. They’re not. Consider my high school daughter’s experience as she spent an entire afternoon researching colleges online. Twice, she got to a college’s home page, and couldn’t find a list of majors it offers. Crazy? Yep. Frustrating? You bet. What college wouldn’t make it as simple as possible for a potential student to navigate for basic information, like a degree listing? Use these top ten writing tips to build a solid online presence. A website is today’s calling card. To do business, you must be on the web. Period. Here's a great post that explains how to get started planning a website. No one can remember http://j3978ck*% #.us.l&.567/nashvillehelp, but they will remember www.helpfornashville.com. Click onto www.godaddy.com or any other domain sale site, and spend about ten bucks a year to be recognizable online. And make sure you proofread your site several times for typos. You know the frustration – not being able to find what you know is somewhere on a site. Use clear tool bars and drop-down lists. You may want to even offer a site map. Be careful not to use too many bells and whistles, such as a flash intro or video clips. Be particularly judicious with content “above the fold” – that is, on the top part of each page that loads first. That real estate is incredibly valuable, so use it wisely. Plus, not everyone can support high-speed downloads. If a page takes too long to load before the reader sees copy, he may get impatient and click off. People go online to get information. Content is king. Make sure your site has excellent content that explains your cause and supports your organization. Add regularly to your site to keep it fresh. When you give the reader more than she expects, she’ll keep coming back. Format content with the most important information first. Present it in short, manageable chunks. Use strong headings, subheads, bulleted lists, sidebars, boxes – with lots of space in between everything. You’ll get both scanners and readers on your site. Cater to the scanner, and the reader will be happy too. Use testimonials – and don’t just limit them to a “Testimonials” page. Share first-person stories from your beneficiaries. If a celebrity endorses you, put it on your home page. Sprinkle partners’ kind words in text boxes all over your site. It can be tempting to load copy that is high-falutin’ or that uses corporate-speak. Don’t. Instead, write in a conversational style. Here’s your litmus test: would your grandmother understand your website if she read it? If the answer is yes, you’re probably good to go. Place your contact information on every page. Don’t make surfers click over to a separate “contact” page just to ask you a question. After all, a big reason you have a website is so readers can get in touch with you quickly and find out more about your incredible product, services, or cause ... right?